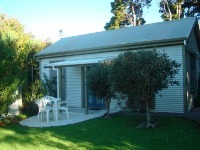 Underhill Cottage Boutique Bed + Breakfast Accommodation, Featherston, South Wairarapa. Information, Photos and Reviews. Stand-alone self-contained Boutique Accommodation catering for two people looking for a peaceful retreat. Generous provisions for both European and cooked breakfasts supplied. Accommodation is serviced daily. An evening meal is available on request. Situated 1.4 kilometers from the township of Featherston and surrounded by farmland. Wake to the sound of birdsong from native birds cavorting in the trees. Nobody has reviewed Underhill Cottage Boutique Bed + Breakfast Accommodation yet, Be the first. You are submitting a booking enquiry. Underhill Cottage Boutique Bed + Breakfast Accommodation will then contact you by email with details of availability and prices.